No, Dwayne Johnson isn't swinging like Austin Powers, but instead he's literally swinging from a helicopter on the new poster for San Andreas. The action thriller arrives this summer with Johnson playing a helicopter pilot trying to survive one of the deadliest earthquakes humanity has ever seen, right on the infamous San Andreas fault line. A new poster seems to give us the viewpoint of someone being rescued as the Earth crumbles and breaks above. It's a cool idea for a poster, but it also looks illustrated like concept art, so it's not all that great. But this likely means a new trailer is coming soon, so stay tuned. Look below! You can still watch the teaser trailer for San Andreas right here. San Andreas is directed by Brad Peyton (Journey 2: The Mysterious Island) and written by Allan Loeb (Wall Street: Money Never Sleeps), Carlton Cuse (executive producer and writer of "Lost"), Chad & Carey Hayes (The Conjuring), Jeremy Passmore (Red Dawn) and Andre Fabrizio (Vice). 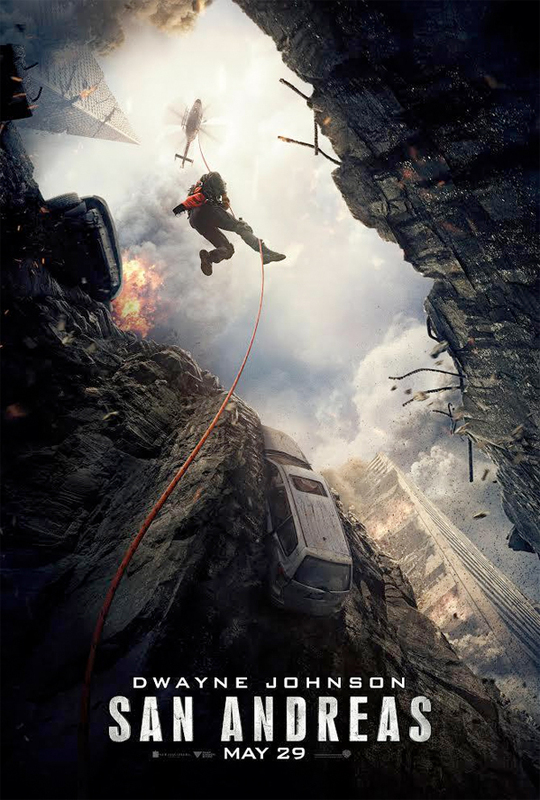 Set in the aftermath of a devastating California earthquake, the movie follows a helicopter pilot (Dwayne Johnson) and his ex-wife (Carla Gugino) as they struggle to leave Los Angeles in order to retrieve their daughter (Alexandra Daddario) from San Francisco. Warner Bros. Pictures releases the film in theaters May 29th this summer. Looks illustrated like a concept art? Are you kidding me? !